At MBC Biolabs, an incubator for biotech startups in San Francisco’s Dogpatch neighborhood, a team of scientists and interns working for the small startup Prellis Biologics have just taken a big step on the path toward developing viable 3D-printed organs for humans. The company, which was founded in 2016 by research scientists Melanie Matheu and Noelle Mullin, staked its future (and a small $3 million investment) on a new technology to manufacture capillaries, the one-cell-thick blood vessels that are the pathways which oxygen and nutrients move through to nourish tissues in the body. Without functioning capillary structures, it is impossible to make organs, according to Matheu. They’re the most vital piece of the puzzle in the quest to print viable hearts, livers, kidneys and lungs, she said. “Microvasculature is the fundamental architectural unit that supports advanced multicellular life and it therefore represents a crucial target for bottom-up human tissue engineering and regenerative medicine,” said Jordan Miller, an assistant professor of bioengineering at Rice University and an expert in 3D-printed implantable biomaterial structures, in a statement. This real-time video shows tiny fluorescent particles – 5 microns in diameter (the same size as a red blood cell) – moving through an array of 105 capillaries printed in parallel, inside a 700 micron diameter tube. Each capillary is 250 microns long. Now, Prellis has published findings indicating that it can manufacture those capillaries at a size and speed that would deliver 3D-printed organs to the market within the next five years. Prellis uses holographic printing technology that creates three-dimensional layers deposited by a light-induced chemical reaction that happens in five milliseconds. This feature, according to the company, is critical for building tissues like kidneys or lungs. Prellis achieves this by combining a light-sensitive photo-initiator with traditional bioinks that allows the cellular material to undergo a reaction when blasted with infrared light, which catalyzes the polymerization of the bioink. Prellis didn’t invent holographic printing technology. Several researchers are looking to apply this new approach to 3D printing across a number of industries, but the company is applying the technology to biofabrication in a way that seems promising. The speed is important because it means that cell death doesn’t occur and the tissue being printed remains viable, while the ability to print within structures means that Prellis’ technology can generate the internal scaffolding to support and sustain the organic material that surrounds it, according to the company. The video above, courtesy of Prellis Biologics, shows real-time printing of a cell encapsulation device that is useful for producing small human cells containing organoids. The structure is designed to be permeable and the size is 200 microns in diameter and can contain up to 2000 cells. Prellis isn’t the first company to develop three-dimensional organ printing. There have been decades of research into the technology, and companies like BioBots (which made its debut on the TechCrunch stage) are already driving down the cost of printing living tissue. Now called Allevi, the company formerly known as BioBots has seen its founders part ways and its business strategy shift (it’s now focusing on developing software to make its bioprinters easier to use), according to a report in Inc. Allevi has slashed the cost of bioprinting with devices that sell for less than $10,000, but Prellis contends that the limitations of extrusion printing mean that technology is too low resolution and too slow to create capillaries and keep cells alive. Prellis’ organs will also need to be placed in a bioreactor to sustain them before they’re transplanted into an animal, but the difference is that the company aims to produce complete organs rather than sample tissue or a small cell sample, according to a statement. The bioreactors can simulate the biomechanical pressures that ensure an organ functions properly, Matheu said. Matheu estimates that it will take two-and-a-half years and $15 million to bring implantable organs through their first animal trials. “That will get a test kidney into an animal,” she said. The goal is to print a quarter-sized kidney that could be transplanted into rats. “We want something that would be able to handle a kidney that we would transplant into a human,” Matheu said. 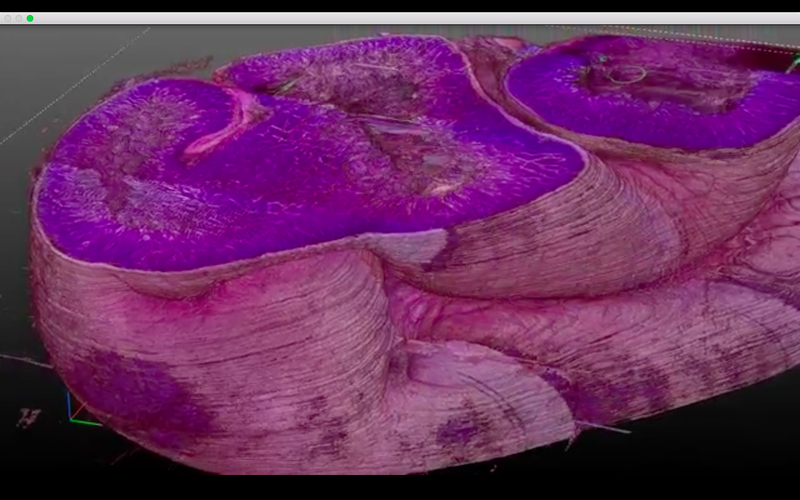 One frame of a 3D map of animal tissue from 3Scan. Earlier this year, researchers at the University of Manchester href="https://newatlas.com/working-kidney-cells-grown-mice/53354/"> grew functional human kidney tissue from stem cells for the first time. The scientists implanted small clusters of capillaries that filter waste products from the blood that had been grown in a Petri dish into genetically engineered mice. After 12 weeks, the capillaries had grown nephrons — the elements that make up a functional human kidney. Ultimately, the vision is to export cells from patients by taking a skin graft or blood, stem cell or bone marrow harvest — and then use those samples to create the cellular material that will grow organs. “Tissue rejection was the first thing I was thinking about in how I was designing the process and how we could do it,” says Matheu. While Prellis is spending its time working to perfect a technique for printing kidneys, the company is looking for partners to take its manufacturing technology and work on processes to develop other organs. Last year, the company outlined a go-to-market strategy that included developing lab-grown tissues to produce antibodies for therapeutics and drug development. The company’s first targeted human tissue printed for clinical development were cells called “islets of Langerhans,” which are the units within a pancreas that produce insulin. “Type 1 diabetics lose insulin-producing islets of Langerhans at a young age. If we can replace these, we can offer diabetes patients a life free of daily insulin shots and glucose monitoring,” said Matheu in a statement at the time. Matheu sees the technology she and her co-founder developed as much about a fundamental shift in manufacturing biomaterials as a novel process to print kidneys, specifically. Meanwhile, the need for some solution to the shortage in organ donations keeps growing. Matheu said that one in seven adults in the U.S. have some sort of kidney ailment, and she estimates that 90 million people will need a kidney at some point in their lives. Roughly 330 people die every day from organ failure, and if there were a fast way to manufacture those organs, there’s no reason for those fatalities, says Matheu. Prellis estimates that because of the need for human tissue and organ replacement alternatives, as well as human tissue for drug discovery and toxicology testing, the global tissue engineering market will reach $94 billion by 2024, up from $23 billion in 2015. “We need to help people faster,” says Matheu.